Olive Oil And Weight Loss...Olive oil contains 120 calories per tablespoon and 14 grams of fat. But can you believe that olive oil has been used as a dieting tool to lose weight? There are plenty of people that I've seen who look fit and skinny but have high blood pressure and high cholesterol. I've also met people who are overweight and they also have high blood pressure and high cholesterol. Of course, you need to consider many factors like family history, genes, daily diet, etc. The answer isn't so simple. However, if you're going to eat fat and your body does require good fat, go for the good fat that will maintain your health and even boost your energy. Olive oil is rich in antioxidants and polyphenols. But even too much of a good thing isn't so great for you so you need to take caution not to over-indulge. Fats and olive oil - Eat good fats is key to maintaining good health. Oils that contain unsaturated fat like safflower oil, sunflower oil and corn oil as well as monounsaturated fat such as avocados, olive oil and canola oil are recommended. They are also good for burning fat and therefore, helping you to lose weight. These good fats will not only help boost energy but also suppress hunger and therefore, help you maintain your weight. It contains fat-soluble properties that help to metabolize fat-soluble vitamins A, D, E and K.
It also contains omega-3 and 6 essential fatty-acids, which are great for fat metabolism. Foods that are high in these essential fatty-acids are fatty fish, such as tuna, mackerel and herring. Federal Drug Administration (FDA) has recommended that taking 2 tablespoons of olive oil daily can prevent heart disease. Olive oil has been known to suppress your hunger and increase energy. You can definitely drink a few tablespoons by itself to stave off hunger but you may not like it straight up. It may also not be so easy on your stomach to digest. If this is the case, you can do what the Europeans do and use it to dip bread and eat it that way. You can also put a few tablespoons in your breakfast cereal for extra energy. There are many ways to eat and drink olive oil. My final words on this is that if there's one thing that I've learned about health and diet in all the years of learning about food and health is that "Quantity changes Quality". What that means is balance is key to health. No matter how good anything is for you, anything in excess will cause harm in the long run. It's important to understand that dietary cholesterol isn't necessarily bad although it's best to limit the amount of cholesterol you eat if you have diabetes. The level of cholesterol in the bloodstream in terms of the type of fats that are in your diet is what's critical in determining your overall outlook on health rather than the amount of cholesterol you eat. Olive oil and diabetes - Learn about Diabetes and how using olive oil is beneficial to your overall health in healing and preventing diabetes and heart disease. One of the many great health benefits of olive oil is that it helps people who suffer from diabetes. Many researches have been done on the link between olive oil and diabetes and positive evidence suggests that olive oil can play a role in preventing diabetes. It also helps by changing the diets if you already suffer from diabetes. To understand diabetes, we need to understand something about blood sugar. Our blood contains some sugar - this is normal. The level of sugar in our blood is lowest in the morning before eating, and rises after eating from the sugar we digest. Although it goes up and down throughout the day, a body that is healthy will regulate the level of sugar in the blood so that it remains within a narrow range. It's necessary for the body to regulate the amount of sugar in the blood, because too little sugar (known as hypoglycemia) makes you lethargic, can cause unconsciousness, and may even result in brain damage. Unfortunately, there is an ever increasing level of people who are hypoglycemic in America. The opposite, too much sugar in the blood (hyperglycemia), is also dangerous, because if it?s sustained it causes damage to the kidneys, eyes and nervous system. So why don't we all get hyperglycemic after eating? The answer is one of our body's little helpers: insulin! Insulin is a hormone that decreases blood sugar, preventing it from getting too high. However, some people?s bodies either don?t produce enough insulin, or are abnormally resistant to what it does, and this is the disease that we call diabetes. As a food, olive oil is mostly used to cook things in. Like other substances used for cooking, such as butter, vegetable shortening, and lard, olive oil is high in fat. However, it's significantly lower in saturated fat (bad fat) and high in monounsaturated fat (good, healthy fat). And the evidence shows that it is the saturated fat that leads to an increased risk of developing diabetes. So replacing butter in someone's diet with olive oil will lead to a reduced risk of them developing diabetes. Even better, some research shows that monounsaturated fat could actually help to lower blood sugar levels. One study found that blood sugar levels were lower in diabetics who ate a diet rich in monounsaturated fat than they were in those who simply ate a low-fat diet. In other words, if you are diabetic, you'd be better off cutting other fat out of your diet but keeping or adding olive oil in, as opposed to just cutting out all fats altogether. The fact that olive oil might actually be good for diabetes sufferers is great news for them. The classic "diabetic diet" is usually low in both carbohydrates and fat, but the problem with this is that fat and carbohydrates are very satisfying to eat, and a diet that is low in both of these is pretty hard to stick to! This is where olive oil comes in. It tastes good and it's satisfying to eat, so it eliminates the cravings that people get when they try to cut fat completely out of their diet. Besides the link between olive oil and diabetes, olive oil is also positively linked to preventing other types of chronic illnesses such as heart disease, some cancers such as breast cancer and colon cancer. Olive Oil And Diabetes...The health benefits of a diet that's high in olive oil have actually been demonstrated by people living in Mediterranean areas, such as Greece and Southern Italy, for hundreds of years. Despite the fact that people in these places have traditionally had a diet that?s high in fat, they have much lower rates of diabetes and heart disease than in the US. A lot of people believe that this is because most of the fat in their diet is monounsaturated fat from olive oil, and not saturated fat from butter or lard. It could be that the Mediterranean diet, which contains a lot of fruit, fish, vegetables, poultry, and some dairy, red meat, and red wine, would have similar health benefits if adopted by people elsewhere in the world - and cooking with olive oil is the key. Traditionally a low fat diet has been prescribed to prevent various diseases such as heart disease and diabetes. While studies have shown that high fat diets may increase the risk of certain diseases such as cancer and diabetes, it appears that it is the type of fat that counts rather than the amount of fat. We now know that a diet rich in monounsaturated fats such as the ones found in olive oil, nuts and seeds actually protects from many of these chronic diseases. A recent Spanish study published in the scientific journal Diabetes Care showed that a Mediterranean style diet rich in olive oil reduces the risk of type II diabetes by almost 50 percent compared to a low fat diet. Type II diabetes is the most common and preventable form of diabetes. Individuals who are obese or overweight and have metabolic syndrome are at highest risk for developing this form of diabetes. The study is part of PREDIMED, a long-term nutritional intervention study aimed to assess the efficacy of the Mediterranean diet in the primary prevention of cardiovascular diseases, and is composed of a multidisciplinary team of 16 groups distributed in 7 autonomous communities in Spain. The study included 418 participants who did not have diabetes. Each participant was randomly assigned to either a low fat diet, a Mediterranean diet with olive oil (up to 1 liter a week) or a Mediterranean diet with nuts (30 grams a day). After 4 years 17.9 percent of the individuals following the low fat diet developed diabetes, while only 10 percent of the participants following the Mediterranean with olive oil diet developed the disease. When the two MedDiet groups (olive oil and nut groups) were pooled and compared with the low fat group, diabetes incidence was reduced by 52 percent. It is important to note that the reduction of diabetes risk was independent of changes in body weight or physical activity and that the Mediterranean diets that were followed were not calorie restricted. Previous studies have shown that a Mediterranean style diet rich in olive oil may prevent the appearance of type II diabetes by improving blood sugar levels, insulin resistance and blood lipid levels. Reduction in the incidence of type 2 diabetes with the Mediterranean diet: results of the PREDIMED-Reus nutrition intervention randomized trial. Diabetes Care. 2011 Jan;34(1):14-9. · Olive oil is one of the healthiest substitutes for any fat used in any cooking recipe. Try substituting butter or shortening with olive oil. · People who live in the Mediterranean countries have some of the lowest mortality rates in the world from cardiovascular-related diseases. There are many researches showing positive links between Mediterranean diet and olive oil, which is their main source of fat. · Whereas the people living in Finland and the United States, who consume the highest amounts of saturated fat, have the highest mortality rate in the world. · Olive oil contains more monounsaturated fatty acids than any other fat or oil. · Olive oil is the most easily absorbed edible fat. · Olive oil contains absolutely no cholesterol. 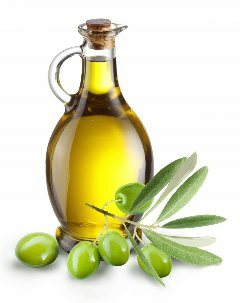 · Using olive oil in place of saturated fats as the main fat in your diet may actually help reduce cholesterol levels. · You can bake with olive oil. Just substitute the same amount for the fat called for in the recipe. The result is moist, even textured cake with a tender crumb. · You can fry with olive oil. When used in frying, olive oil coats food instead of being absorbed. It also contains high amounts of antioxidants and can be reused 4-5 times before being discarded. Other fats and oils can only be used twice. · There are numerous varieties of olives, and olive oil is the only cooking and salad oil that offers a variety of natural flavors - no two are alike. · Olive oil can keep for 2 years or more if unopened and stored properly. · Olive oil can keep even longer than any other oil, if stored in a cool dark place. · Olive oil is the second best-selling type of oil and the fastest growing segment of fats and oils in the United States. · The olive tree is an evergreen. · The olive tree was first cultivated in 6,000 B.C. · Olive trees can live up to 600 years or more. · It takes 5-8 years before an olive tree will bear its first fruit.